Integration testing is done to test the modules/components when integrated to verify that they work as expected i.e. to test the modules which are working fine individually does not have issues when integrated. When talking in terms of testing large application using black box testing technique, involves the combination of many modules which are tightly coupled with each other. We can apply the Integration testing technique concepts for testing these types of scenarios. Is Integration a White box or Black box Technique? 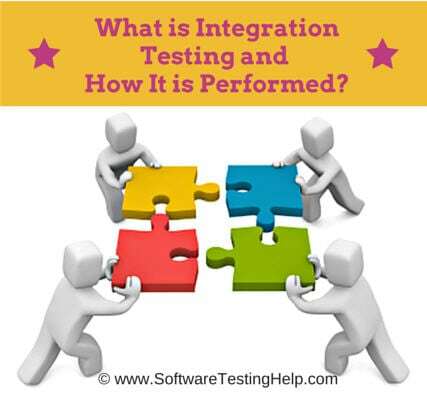 The meaning of Integration testing is quite straightforward- Integrate/combine the unit tested module one by one and test the behavior as a combined unit. The main function or goal of this testing is to test the interfaces between the units/modules. We normally do Integration testing after “Unit testing”. Once all the individual units are created and tested, we start combining those “Unit Tested” modules and start doing the integrated testing. The individual modules are first tested in isolation. Once the modules are unit tested, they are integrated one by one, till all the modules are integrated, to check the combinational behavior, and validate whether the requirements are implemented correctly or not. Here we should understand that Integration testing does not happen at the end of the cycle, rather it is conducted simultaneously with the development. So in most of the times, all the modules are not actually available to test and here is what the challenge comes to test something which does not exist! We feel that Integration testing is complex and requires some development and logical skill. That’s true! Then what is the purpose of integrating this testing into our testing strategy? In the real world, when applications are developed, it is broken down into smaller modules and individual developers are assigned 1 module. The logic implemented by one developer is quite different than another developer, so it becomes important to check whether the logic implemented by a developer is as per the expectations and rendering the correct value in accordance with the prescribed standards. Many a time the face or the structure of data changes when it travels from one module to another. Some values are appended or removed, which causes issues in the later modules. Modules also interact with some third party tools or APIs which also need to be tested that the data accepted by that API / tool is correct and that the response generated is also as expected. A very common problem in testing – Frequent requirement change! :) Many a time developer deploys the changes without unit testing it. Integration testing becomes important at that time. There are several advantages of this testing and few of them are listed below. This testing makes sure that the integrated modules/components work properly. Integration testing can be started once the modules to be tested are available. It does not require the other module to be completed for testing to be done, as Stubs and Drivers can be used for the same. It detects the errors related to the interface. Listed below are few challenges that are involved in Integration Test. #1) Integration testing means testing two or more integrated systems in order to ensure that the system works properly. Not only the integration links should be tested but an exhaustive testing considering the environment should be done to ensure that the integrated system works properly. There might be different paths and permutations which can be applied to test the integrated system. #2) Managing Integration testing becomes complex because of few factors involved in it like the database, Platform, environment etc. #3) While integrating any new system with the legacy system, it requires a lot of changes and testing efforts. Same applies while integrating any two legacy systems. #4) Integrating two different systems developed by two different companies is a big challenge as for how one of the systems will impact the other system if any changes are done in any one of the systems is not sure. In order to minimize the impact while developing a system, few things should be taken into consideration like possible integration with other systems, etc. Given below is a type of Test Integration along with its advantages and disadvantages. Big bang approach integrates all the modules in one go i.e. it does not go for integrating the modules one by one. It verifies if the system works as expected or not once integrated. If any issue is detected in the completely integrated module, then it becomes difficult to find out which module has caused the issue. Big bang approach is a time-consuming process of finding a module which has a defect itself as that would take time and once the defect is detected, fixing the same would cost high as the defect is detected at the later stage. It is a good approach for small systems. It is difficult to detect the module which is causing an issue. Big Bang approach requires all the modules all together for testing, which in turn, leads to less time for testing as designing, development, Integration would take most of the time. Testing takes place at once only which thereby leaves no time for critical module testing in isolation. Prepare integration test scenarios & test cases. Track and re-test the defects. Re-testing & testing goes on until integration testing is complete. Bottom-up testing, as the name suggests starts from the lowest or the innermost unit of the application, and gradually moves up. The Integration testing starts from the lowest module and gradually progresses towards the upper modules of the application. This integration continues till all the modules are integrated and the entire application is tested as a single unit. In this case, modules B1C1, B1C2 & B2C1, B2C2 are the lowest module which is unit tested. Module B1 & B2 are not yet developed. The functionality of Module B1 and B2 is that it calls the modules B1C1, B1C2 & B2C1, B2C2. Since B1 and B2 are not yet developed, we would need some program or a “stimulator” which will call the B1C1, B1C2 & B2C1, B2C2 modules. These stimulator programs are called DRIVERS. In simple words, DRIVERS are the dummy programs which are used to call the functions of the lowest module in a case when the calling function does not exist. The bottom-up technique requires module driver to feed test case input to the interface of the module being tested. The advantage of this approach is that, if a major fault exists at the lowest unit of the program, it is easier to detect it, and corrective measures can be taken. The disadvantage is that the main program actually does not exist until the last module is integrated and tested. As a result, the higher level design flaws will be detected only at the end. This technique starts from the topmost module and gradually progress towards the lower modules. Only the top module is unit tested in isolation. After this, the lower modules are integrated one by one. The process is repeated until all the modules are integrated and tested. In the context of our figure, testing starts from Module A, and lower modules B1 and B2 are integrated one by one. Now here the lower modules B1 and B2 are not actually available for integration. So in order to test the topmost modules A, we develop “STUBS”. “Stubs” can be referred to as code a snippet which accepts the inputs/requests from the top module and returns the results/ response. This way, in spite of the lower modules, do not exist, we are able to test the top module. In practical scenarios, the behavior of stubs is not that simple as it seems. In this era of complex modules and architecture, the called module, most of the time involves complex business logic like connecting to a database. As a result, creating Stubs becomes as complex and time taking as the real module. In some cases, Stub module may turn out to be bigger than the stimulated module. Top most module is tested first Lowest modules are tested first. The only change is Constant in this world, so we have another approach called “Sandwich testing” which combines the features of both Top-down and bottom-up approach. When we test huge programs like Operating systems, we have to have some more techniques which are efficient and boosts more confidence. Sandwich testing plays a very important role here, where both, the Top down and bottom up testing are started simultaneously. Integration starts with the middle layer and moves simultaneously towards up and down. In case of our figure, our testing will start from B1 and B2, where one arm will test the upper module A and another arm will test the lower modules B1C1, B1C2 & B2C1, B2C2. Since both the approach starts simultaneously, this technique is a bit complex and requires more people along with specific skill sets and thus adds to the cost. Now let’s talk about how we can imply integration testing in Black box technique. We all understand that a web application is a multitier application. We have a front end which is visible to the user, we have a middle layer which has business logic, we have some more middle layer which does some validations, integrate some third party APIs etc., then we have the back layer which is the database. I am the owner of an advertising company and I post ads on different websites. At the end of the month, I want to see how many people saw my ads and how many people clicked on my ads. I need a report for my ads displayed and I charge accordingly to my clients. UI – User Interface module, which is visible to the end user, where all the inputs are given. BL – Is the Business Logic module, which has all the all the calculations and business specific methods. VAL – Is the Validation module, which has all the validations of the correctness of the input. CNT – Is the content module which has all the static contents, specific to the inputs entered by the user. These contents are displayed in the reports. EN – Is the Engine module, this module reads all the data that comes from BL, VAL and CNT module and extracts the SQL query and triggers it to the database. DB – Is the Database. Now, having seen the architecture of the entire web application, as a single unit, Integration testing, in this case, will focus on the flow of data between the modules. How the BL, VAL and the CNT module will read and interpret ate the data entered in the UI module? Is BL, VAL and CNT module receiving the correct data from UI? In which format the data from BL, VAL and CNT is transferred to the EQ module? How will the EQ read the data and extract the query? Is the query extracted correctly? Is the Scheduler getting the correct data for reports? Is the result set received by the EN, from the database is correct and as expected? Is EN able to send the response back to the BL, VAL and CNT module? Is UI module able to read the data and display it appropriately to the interface? In the real world, the communication of data is done in an XML format. So whatever data the user enters in the UI, it gets converted into an XML format. In our scenario, the data entered in the UI module gets converted into XML file which is interpreted by the 3 modules BL, VAL and CNT. The EN module reads the resultant XML file generated by the 3 modules and extracts the SQL from it and queries into the database. The EN module also receives the result set and converts it into an XML file and returns it back to the UI module which converts the results in user readable form and displays it. In the middle we have the scheduler module which receives the result set from the EN module, creates and schedules the reports. So where Integration testing does comes into the picture? Well, testing whether the information/data is flowing correctly or not will be your integration testing, which in this case would be validating the XML files. Are the XML files generated correctly? Do they have the correct data? Are the data is being transferred correctly from one module to another? All these things will be tested as part of Integration testing. Try to generate or get the XML files and update the tags and check the behavior. This is something very different from the usual testing which testers normally do, but this will add value to the testers knowledge and understanding of the application. Are the menu options generating the correct window? Are the windows able to invoke the window under test? For every window, identify the function calls for the window that the application should allow. Identify reversible calls: closing a called window should return to the calling window. Identify irreversible calls: calling windows closes before called window appears. Test the different ways of executing calls to another window e.g. – menus, buttons, keywords. Understand the architecture of your application. Understand how the data is transferred from one module to another. Segregate the application to suit your testing needs. Take one condition at a time and write down the test cases. Integration test plan document is signed off and approved. Integration test cases have been prepared. Unit testing of developed modules/Components is complete. All the critical and high Priority defects are closed. The test environment is set up for integration. All the integration test cases have been executed. No critical and Priority P1 & P2 defects are opened. Test Report has been prepared. Integration test cases focus mainly on the interface between the modules, integrated links, data transfer between the modules as modules/components that are already unit tested i.e. the functionality and the other testing aspects have already been covered. So, the main idea is to test if integrating two working modules works as expected when integrated. Verifying the interface link between the login page and the home page i.e. when a user enters the credentials and logs it should be directed to the homepage. Verifying the interface link between the home page and the profile page i.e. profile page should open up. Verify the interface link between the network page and your connection pages i.e. clicking accept button on Invitations of the network page should show the accepted invitation in your connection page once clicked. Verify the interface link between the Notification pages and say congrats button i.e. clicking say congrats button should direct towards the new message window. Many integration test cases can be written for this specific site. The above four points are just an example to understand what Integration test cases are included in testing. Integration testing technique can be counted in both black boxes as well as white box technique. Black box technique is where a tester need not have any internal knowledge of the system i.e. coding knowledge is not required whereas white box technique needs internal knowledge of the application. Now while performing integration testing it could include testing the two integrated web services which will fetch the data from the database & provide the data as required which means it could be tested using white box testing technique whereas integrating a new feature in the website can be tested using the black box technique. So, it’s not specific that integration testing is a black box or white box technique. There are several tools available for this testing. System Integration Test is done to test the complete integrated system. Modules or components are tested individually in unit testing before integrating the components. Once all the modules are tested, system integration testing is done by integrating all the modules and the system as a whole is tested. Integration testing is a testing in which one or two modules which are unit tested are integrated to test and verification is done to verify if the integrated modules work as expected or not. System testing is a testing where the system as a whole is tested i.e. all the modules/components are integrated together to verify whether the system works as expected and no issues occur because of the integrated modules. This is all about Integration testing and its implementation in both White box and Black box technique. Hope we explained it clearly with relevant examples. Test Integration is an important part of the testing cycle as it makes it easier to find the defect when two or more modules are integrated in order to integrate all the modules all together in the first step itself. It helps in finding the defects at an early stage which in turn saves the effort and cost as well. It ensures that the integrated modules work properly as expected. Hope this informative tutorial on Integration Testing would have enriched your knowledge of the concept. Article is very informative and very easy to understand..
Hi Shilpa, very soon i would be working on Investment banking domain,( preferably mortgages) request you to share info on the above domain and how to test. Please share as an article or please share it to my mail id. I it very good and informative article, Shilpa posses very good knowledge in testing as well as in teaching/explaining the topic. It is appreciable that the complex topic like integration testing has been explained in very easy manner. I think every one who has a little knowledge will understand this topic. Thanks a ton to shilpa. I think every one who has a little knowledge in testing will understand this topic. Thanks a ton to shilpa. nice post. mixed approach is good in most cases. Again thanks STH for the article especially about the two approaches for integration testing. Hope for some tools in future post…. i tried to find it but i couldnt so i wanna ask something to you. What is the EQ module? Very nice artical….very helpful for me !! @Krishna, Before you jump into Investment Banking domain, I would recommend you to read the articles from NCFM and try to find and give some certification on those. This will really help you on the domain front and eventually on testing. To design you Integration testing strategy, its important to understand the architecture and the data flow of your application. So go step by step. First understand the Domain, then the application , architecture and the break it to design your test strategy. Don’t forget to draw your scope here. @Burcu – Its the EN module. Good article ..but again same query in my mind. Can you please explain with practical example (like login page etc) which is higher module and which is lower module. What are error messages in integration testing? Thanks for explaining integration testing with an example easy to understand. I have a question about the tools that are used for integration testing. What are the commonly used tools for this stage of testing? Your Article is very nice … can you Provide real time Example on interface testing . The goal of integration testing is to make sure a system consisting of a number of components will function according to specifications when all the components are put together. If that is the case, why spend time testing interfaces between interacting modules? Why not just put them all together and test the system as a whole? Can i arguments both for and against with examples? I need Integration test plan for GPS application. Can anyone help out? very very good article for getting knowledge about testing environment as well as fro developer.